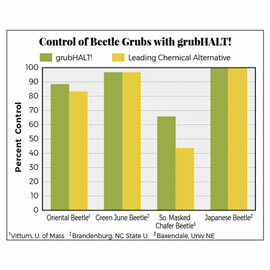 Rainfall or irrigation causes the active ingredient in grubHALT! to be released from the granules. Once released, it is carried into the soil and root zone of turf and ornamentals. 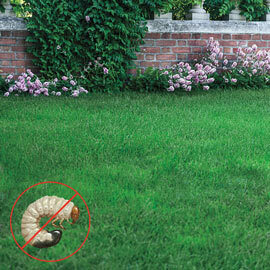 White grubs ingest the soil-borne Bt and perish. As with any insecticide, insect mortality varies with larval size, grub species and the dose of the active ingredient consumed. Not only is Bt galleriae effective, but it's also safe for use on all types of grass and ornamentals--it is not phytotoxic, meaning it won't harm your lawn or plants as it eliminates your grub problem. Effective, Safe, Easy to Use! Simply apply grubHALT! granules using a broadcast spreader when insect grubs are known to be in the soil. The best time to apply is when adults are flying in the area and laying eggs. 2.6 lbs covers 1000 sq. ft. of lawn. Can Be Used in A Variety of Places!